The Messages feature lets you view messages sent to you by DecoNetwork. It also lets you create messages that can be viewed by your affiliate store owners when they log in to their stores and/or emailed to them. A history is kept of all the messages that you have previously received and created. You access your messages in the same way your affiliate store owner would access them. Click on the 'Messages' icon located in the blue bar at the top of the page. The messages drop-down is displayed showing all unread messages sent from DecoNetwork. Click on the Create new message button. The New Message popup is displayed. Enter a Title for the message. Enter your message in the Body field. Select the store group that you want the message to be visible to. Tick the Send message to store owner's email checkbox if you also want to the message to be sent via email. 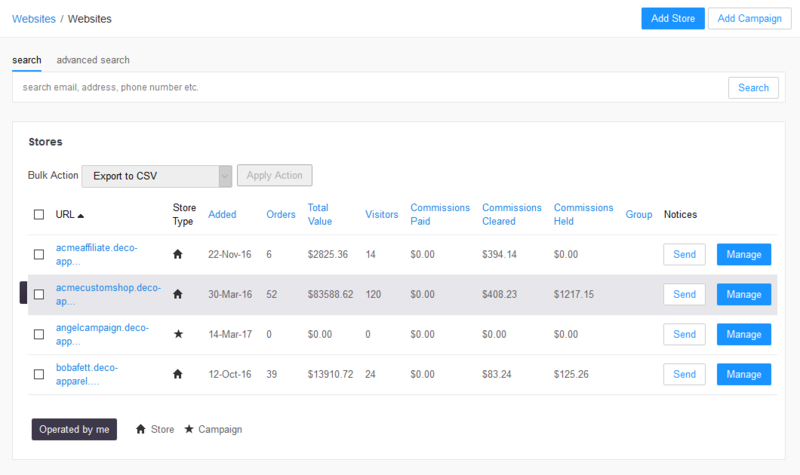 The main work area shows a list of affiliate stores you have attached to your account. Click on the Send button beside the store you want to send a message to. Click on view all messages. The View Notices page is displayed with the Received Messages tab selected. The number in brackets in the tab header indicates the total number of messages in that tab. (You can create a message from this page by clicking on the New Message to Stores button). The Received Messages tab displays all the messages sent from DecoNetwork. The Sent Messages tab displays all the messages you have created. The Messages to Approve tab displays all the messages that you need to approve before they are sent to your affiliate stores. Messages require approval if you select "No" from the Send DecoNetwork messages to stores without my approval dropdown in the Message Settings tab. The Message Settings tab lets you choose whether messages from DecoNetwork require your approval before being sent to your affiliate stores. Click Save to commit the setting.